The author walks through the Red Hills with his 20-gauge while scouting for bobwhite quail and mourning doves. Because I live in Atlanta, many of my adventures in bird hunting and gun dogs occur on plantations. When I share my stories with people, they are often surprised by this reference. Response to the word “plantation” is not always positive, due to recollections of the South’s painful history. That said, I believe that to move toward unity, understanding, and a better future, it is important to shine a light on modern-day plantation culture. Clear understanding of contemporary plantation culture is the best way to address the understandable discomfort associated with the word “plantation” for non-hunters and minority communities. Though a stigma remains associated with the word, I would like to encourage folks to no longer fear the word “plantation” or actual modern plantation grounds. While I certainly don’t believe that we should forget our history or dilute it, I do believe that we can alleviate fear of a certain culture, and in so doing embrace the outdoors for the beautiful sanctuary that it is. I personally value the days that I spend strolling through the Red Hills with my double gun, as only then can I truly think about the many feet that have traversed and hunted the Southeastern landscape. Neal’s male English Pointer locks up in thick brush. Historically, a few select African Americans on the southeastern plantations were dedicated to raising quality bird dogs. This was a special kind of privileged work, as the ability to rear and train bird dogs was regarded as a highly-specialized skill that offered a bit of job security. Unfortunately, at the same time the field hands on the same plantations were often viewed as exchangeable labor. I learned this history while visiting a legend of a dog-man by the name of Neal Jr., who has been featured in notable magazines such as Covey Rise and Garden & Gun. Mr. Neal Jr. recently retired from a career on a plantation in Thomasville, Georgia. While many of us enjoy dog training as an enjoyable pastime, training bird dogs and hunting was arduous work for bird dog elders such as Neal Jr. Such men were tasked with raising a kennel-full of finished bird dogs to guide prospective clients for the plantation masters. 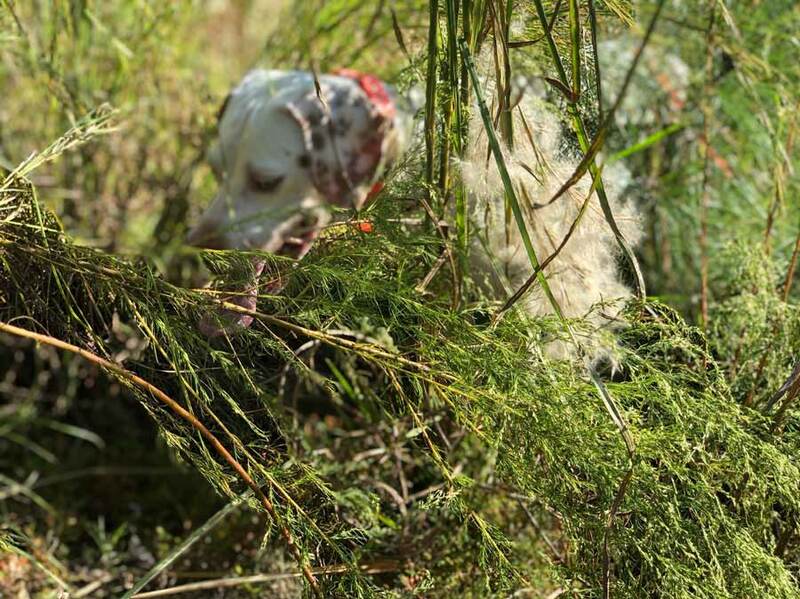 When plantation owners came to hunt the quail fields personally or with friends, it was a point of pride that the dogs perform perfectly. Consider a perfect bird dog. Producing such a thing … now that is a lot of pressure! But the social construct of the time illuminates the degree to which effective bird-dog training was not only expected but demanded. 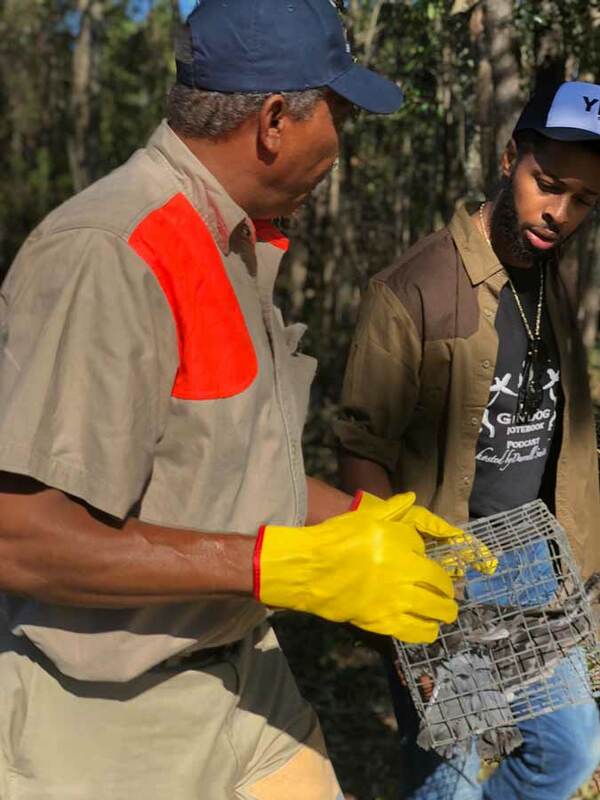 What stood out to me in speaking to Mr. Neal Jr. was the confidence he had in his training ability, and the fact that he maintains zero regret about working on a plantation. For him, plantation life was thoroughly fulfilling, and the dogs gave him something to look forward to, day in and day out. The owners of the plantation fully trusted that he would effectively train the dogs to be mannerly shooting dogs, ensuring complete hunter satisfaction. Neal Jr. shows how he uses homing pigeons to train his English Pointers on bird scent. While making my most recent trip to scout plantation country, I spoke with my wife about her grandfather, who once lived on a plantation in the Red Hills of Georgia. Proximity to the rich history and natural beauty of Camilla, Albany, and Thomasville makes me even more curious about the histories of the remarkable bird dogs and hunters that ventured to South Georgia in search of gentleman bobwhites. What I know and accept is the fact that my curiosity and passion for training bird dogs, especially while living in Georgia, is going to lead me to many plantations over the course of my career, and despite the many confused looks that I often receive, I think if we are to continue our traditions of upland bird hunting, we must remove the stigma of the antiquated perception of the planation. We must create a contemporary definition of the word. I believe the definition of plantation may include a description of creating memories with family and friends, or deepening the inherent bond between dog and man, or connecting to what feels natural, or having spiritual experiences while breathing the fresh air, or feeling renewed after taking in the glory and beauty of uninterrupted fall foliage, or challenging yourself as you reach different goals, or just plain experiencing the fun and adventure that resides in the uplands. 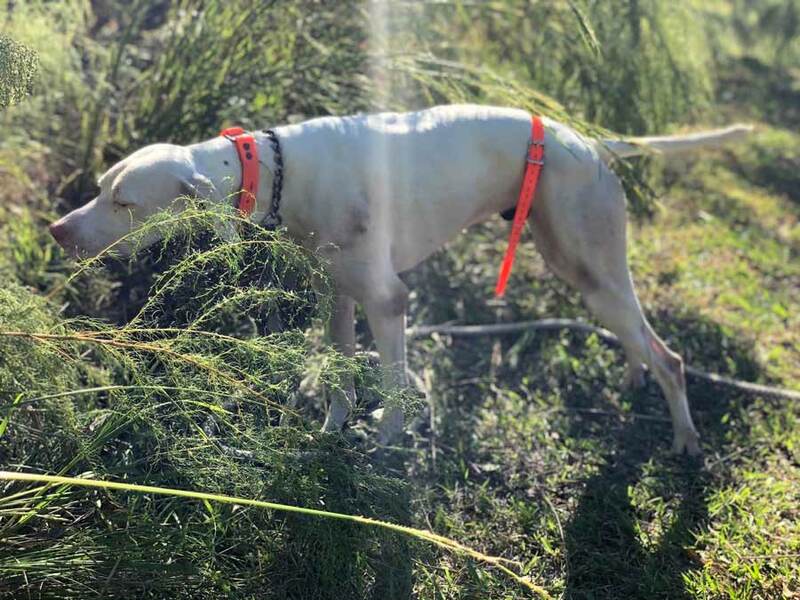 Neal’s female English Pointer holds a staunch point among the pine and wiregrass. I am grateful to be able to enjoy plantations in a different way than my ancestors did. As I walk freely through these lands, I am cognizant that those who came before me dreamed of and fought for the freedom that I enjoy today. With that in mind, I am excited to honor the past and the future by being part of a new narrative that advocates for camaraderie in the outdoors and excites people to get out of their homes and enjoy nature! Plantations continue to cultivate and conserve quality habitat and agriculture for all to enjoy. It is my hope that my work with quality shooting dogs and the joyful nature of the hunt will change the narrative, as I continue to document my journey and my adventures. I encourage everyone to visit southern plantations and explore more histories of the bird-dog South. There are secrets down there, buried deep within the red clay, and pumping through the heart of the Red Hills. Our search for these secrets is embodied in our quest to find bobwhite quail. It serves as confirmation that we are all here for the same reason, and there is value in discovery as we traverse the unknown while hunting game birds over fine shooting dogs, thereby creating our personal histories. 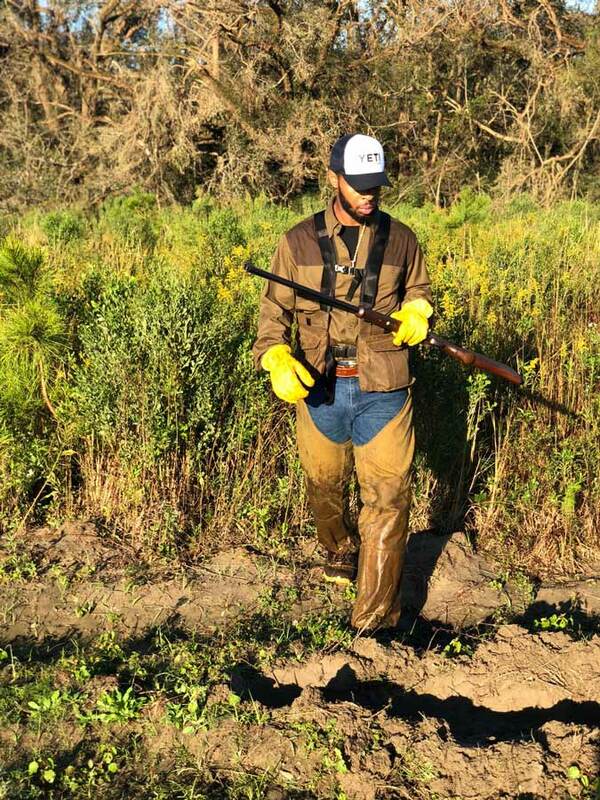 Neal Jr. works one of his seven Pointers in the Plantation country. Though the history of the plantation is fraught with considerable negativity, Mr. Smith provides a refreshing, positive presentation of the modern day plantation. As he so eloquently notes, we should not forget the history that we cannot repeat. So,too, do we have “new” and enlightened approaches to the management and use of these lands that is to the benefit of those who utilize these lands, wildlife and the environment. Excellent article, Mr. Smith!! I really appreciate your understanding of what my goal for this article was, which was to acknowledge the history of modern day plantaitons in the South. I look forward to offering many more personal perspectives on similar subjects! I’ve ridden many a morning with Mr. Neal Jr getting the string back in shape and tightened up. Red Hills plantations are what they are…you failed to mention some of the very finest ate in the great state of Florida…mere miles from the Thomas Co. GA line. Bottom line is that the owners are all mostly northern industrialist billionaires that have at most two generations of family invested and the third could quite frankly care less. The black trainers are excellent… I’ve learned a ton from them. But it’s a job…and a business investment…and when it comes right down to it their jobs are just as expendable as any in their billion dollar companies. Image counts for a lot these days and I’m sure folks from Cleveland or Pittsburg are quite content with proclaiming folks of color under their employ in the ‘deep south’. Two ‘blankety-blanks’ are not given I assure you. Congratulations Mr. Neal Jr. on your retirement. You are a great dog man and I hope you are rewarded upon your twilight as such by those who have gained enjoyment as a result of all your your hard work and sacrifice over all these years. Thanks for your additional information on the article! You are correct in your statements about the state of Florida hosting many great plantations. Much of Tallahassee is synonymous to upland bird hunting, and I hope that there aren’t too many truths to your sentiment about the owners of these plantations. Regardless, being about to meet with Neal Jr. was an honor that I will never forget and I’m excited to have met him. Thanks for your comment SY.